The Barber-Webb Co. Inc. is based in Los Angeles, California, and has a Sales Office in Ashland, Oregon. All manufacturing and fabrication is performed in our Los Angeles facility, but Barber-Webb has construction crews located in both Oregon and California, serving the Western United States. Barber-Webb has a long history of quality service and dependability when it comes to providing custom containment solutions for almost any application. 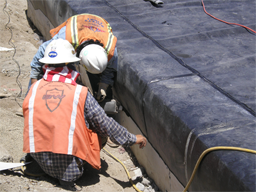 From flexible geomembranes to heavy-duty corrosion and abrasion resistant liners and structures, we have it all. We have been manufacturing, fabricating and installing a wide variety of liners and specialized geosynthetic products, for Industrial, Commercial, Agricultural and Environmental projects, since 1945. The services we offer are top-notch, largely because of our highly trained technicians. They are proficient in plant-based engineering skills, and have on-site problem solving capabilities that help them deliver an efficient and trouble-free installation. From landfills to leach pads, and from methane barriers to reservoirs and hazardous containment, we have the technology, knowledge, and experience it takes to do an outstanding job. Rest assured, your installation will be handled by the best. It takes proper quality control to ensure a successful project. We make quality assurance and control our number one priority, whether it's in our plant, fabrication processes, or our field installations. Every step of every process is monitored by a special team of quality control personnel. We also perform thorough lab testing of materials and seams, to ensure that we meet or exceed any specification, as well as sub-grade and surface inspections, with the most modern field seam testing equipment available. All QA/QC documentation is recorded, along with as-built drawings, for every installation. Contact us in Los Angeles, California, for any of your containment needs.